It's a pleasant and welcomed surprise when sandwich cookies turn out to be easy to make! I always expect a bit of a project and while there's obviously the additional step of making a filling, these cookies were not at all rigorous to put together. No stand mixer needed to make the cookie batter. You do have to toast and grind up some peanuts. In my case, I couldn't find raw peanuts and settled for buying and using dry roasted peanuts (I should have been prepared given how long I waited to make these cookies! And once the moment for action came, I was eager to get to it). I made half the recipe (somewhat regretfully) and used my mini chopper for grinding the nuts; it may not result in the most evenly chopped bits of peanuts but I love the convenience. The best part? No rolling or cutting the dough! Scoop cookie batter into 1-tablespoon size rounds, then use your wet fingers to mold them into 2-inch circles. Bake until cookies are nice and dark golden brown. You'll have lovely crunchy, yet airy, peanut butter cookies. They are very tasty on there own but a lot of the promised peanut butter flavor is in that "uncooked" filling. So for the full PB experience, whip up the filling of your choice (I'd stick with the plain PB going forward). The filling is very easy to make and requires little more than a spin in the microwave and some stirring. When it's combined, and the cookies come together with the filling, you end up with a wonderfully satisfying cookie for any peanut butter lover. Looking at these makes me want to make another batch! Half the recipe made 11 sandwich cookies in my experience and they kept very well in an airtight container for 3 days. This is another terrific America's Test Kitchen recipe. Special thanks to Tricia for making the cookies so beautifully that I couldn't get them out of my head. I knew I'd make them eventually and I'm so glad I did! Make cookies: Adjust oven racks to the upper- and lower-middle positions and preheat oven to 350 degrees. 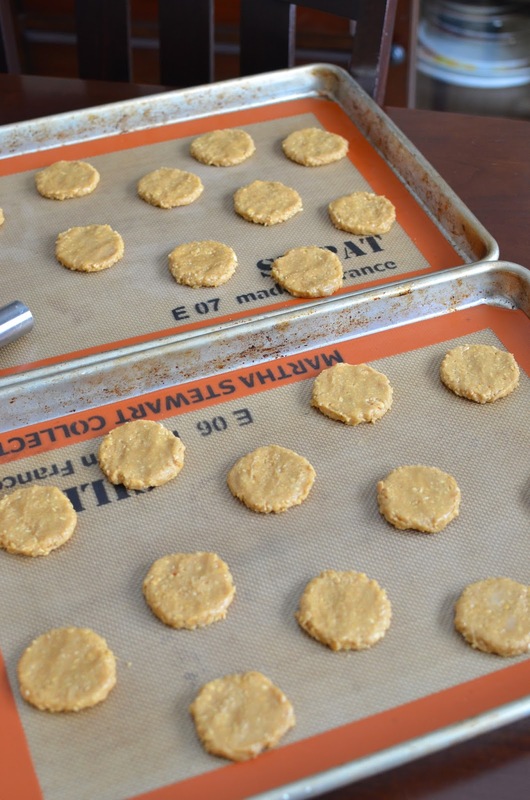 Line 2 baking sheets with parchment paper or silicon baking mats. Pulse peanuts in a food processor until finely chopped, about 8-10 pulses (be careful not to over grind them or the peanuts will turn into a paste). Whisk flour, baking soda, and salt in a bowl. In another bowl, whisk together the melted butter, peanut butter, granulated sugar, brown sugar, milk, and egg. 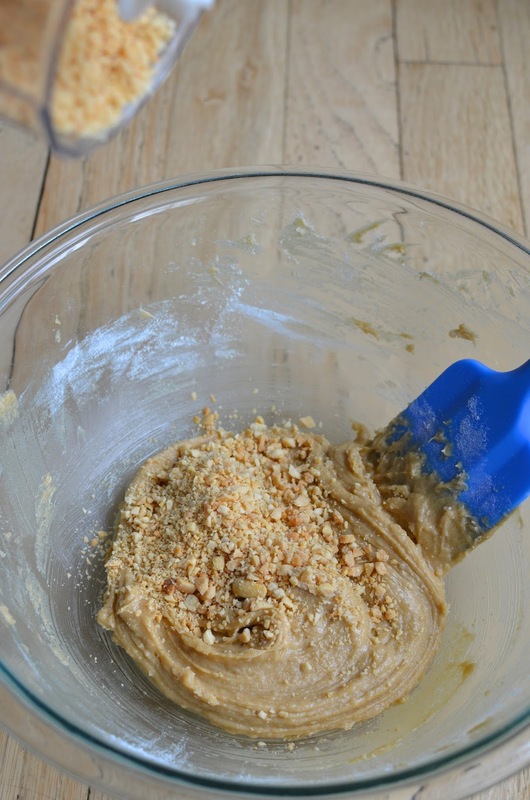 Using a rubber spatula, stir the flour mixture into the peanut butter mixture until just combined. Stir in the peanuts until just incorporated. Using a tablespoon measure (or a #60 scoop if you have it), scoop 12 evenly spaced mounds onto each prepared baking sheet. Using damp hands, flatten mounds into 2-inch diameter rounds. Bake until deep golden brown and firm to the touch, about 15-18 minutes (I would keep a close eye on it near the end), rotating the pans halfway through the baking time. Remove from the oven, let cookies cool for 5 minutes then remove to a cooling rack to cool completely. Repeat with remaining cookie dough. Make filling: Microwave peanut butter and butter until butter is melted and mixture is warm, about 40 seconds. Using a rubber spatula, stir in the confectioners' sugar until combined. (You are looking for a spreadable yet firm filling. You can try to hold back on some of the sugar at first, check for the right consistency, and use amount you find necessary.) Use filling while warm since it was stiffen as it cools. To put sandwich cookies together, place 1-level tablespoon of warm filling onto the flat (bottom) side of a cookie and placing another cookie (right side up) on top. Press gently to spread the filling to the edges. Allow the filling to set for 1 hour before serving. Store cookies in an airtight container for up to 3 days. * Alternate milk chocolate-peanut butter filling: Gently melt 6 ounces of chopped milk chocolate in the microwave. Warm 1/2 cup of creamy peanut butter in the microwave. Stir chocolate into peanut butter, then stir in up to 1 cup confectioners' sugar (start with about 3/4 cup and add enough to make a spreadable but warm filling). Use while warm. I love that you tried a chocolate filling too - chocolate and peanut butter together is always amazing! So happy you made these cookies - they are peanut butter perfection :) Your photos are drool-worthy, gorgeous and have made me want to make these again - no half batch for me haha! Have a wonderful week Monica and thanks. Tricia - thank you again! You made them so beautifully that I wouldn't/couldn't forget! These cookies are so good. When I think peanut butter cookies, these will be the first to come to mind (that, and monster cookies!). The half batch was probably not a smart idea but the only good thing about it is I was able to bake them all in one go. But now, I feel I just have to make them again and soon. Have a wonderful week! I adore peanut butter cookies and sandwich cookies are even better! That means more peanut butter in every bite :) Love that you added a chocolate filling to a few of these too, it gives you more options depending on what you're craving :) I would love to sit down with a batch of these and a tall glass of milk, they look delicious! Thank you, Kelly! These are so rich with peanut butter flavor. If you love PB, you're bound to be a fan. Have a great week! I saw these on Tricia's blog too, and thought they looked great! Now I'm determined to try them - my family would love these. Yes - Tricia makes everything so beautifully and thoughtfully, Beth! : ) I'm not surprised you remember them from her blog! You have to make them. So darn tasty! I saw these on Tricia's blog too, Monica, and I even handwrote down the recipe to try. Yours look just as great as hers, Monica. See - Tricia is beyond convincing! : ) And thank you for the high compliment. These cookies are so good, Angie. Hope you try it as well. You're too funny! Have a great week. Oh my gosh these are fabulous. LOVE! That's exactly it - peanut butter on top of peanut butter, or sandwiched with peanut butter. I can't get enough. Oh man, the peanut butter lover in me is screaming make these now!!! haha I mean, I don't think I could ever get enough peanut butter. These look sooo good! I swear that's exactly the thing about these cookies - they scream "make me" when you see them! ; ) You have a good one, Ashley. Stay warm. Is it spring yet?? I started baking with peanut butter quite late in life. On toast, never! These cookies sound and look perfect to use up all the peanut butter in my cupboard. Love that you tried a chocolate filling...I would have too:-) What a wonderful recipe! Given that PB is one of my favorite things in the entire world, I swear I could eat 7 dozen of these! Pinned! haha - thanks. I figured I might be in the same position so I made half the recipe...but honestly, it just means I'll be making them again soon. That tower of goodness will last at the most in our home. Looks really nice Monica. I like both the fillings, a bit biased to the chocolate one maybe. I have a couple of bottles of local organic peanut butter, I might make them soon. In fact to be honest, I've never made peanut butter cookies ever....really, don't know why..crazy me. Girl, your pictures are so perfect and showcase the cookies beautiful. Thanks - you have a great one as well! I could eat peanut butter every day. Love it! I'm sure I would love these cookies. I'm impressed by how perfectly round and all the same size they came out. Love that you don't need a mixer! I know! It's so satisfying! : ) The recipe is great...I took a little time to make sure I flattened and rounded them off because I had a feeling they bake up just as you placed them in. No mixer is a crazy thought for sandwich cookies, I know! The ground peanuts in the cookies was the thing that really hooked me into this recipe, too, Monica. I'm a big sucker for peanut butter cookies. These look so good. I will definitely make these! I would highly recommend it, Pamela. Knowing your love of PB, you will love them! You can never have too much peanut butter in the pantry. I feel like it's a survival must-have to keep around. : ) That said, these cookies are a worthy place to use your stash. Oh perfect! You know we cannot get those nutter butter cookies over here so homemade peanut cookies is a recipe I need to save for later. 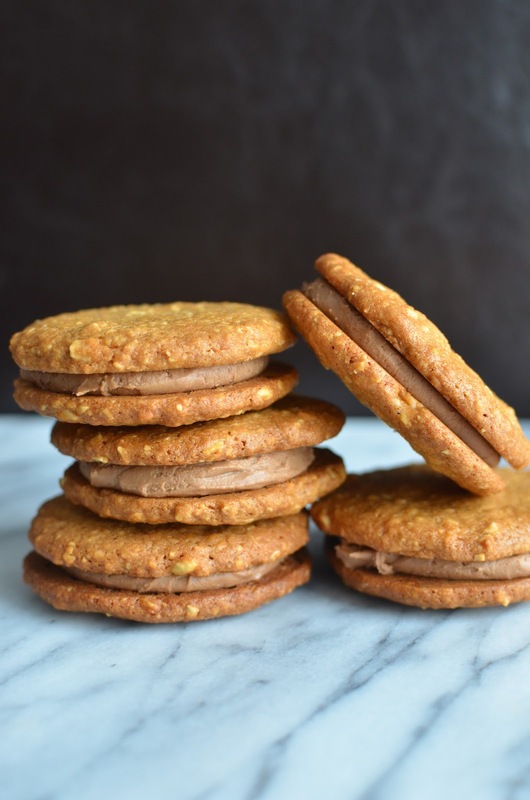 My boys miss the nutter butter cookies so will surprise them with your recipe this weekend. You know what's funny, BAM...making these cookies made me realize that I've never had a Nutter Butter. Need to get my hands on one and try it!! I hope you do make it...I highly recommend it for PB lovers. Oooh these look amazingly delicious! 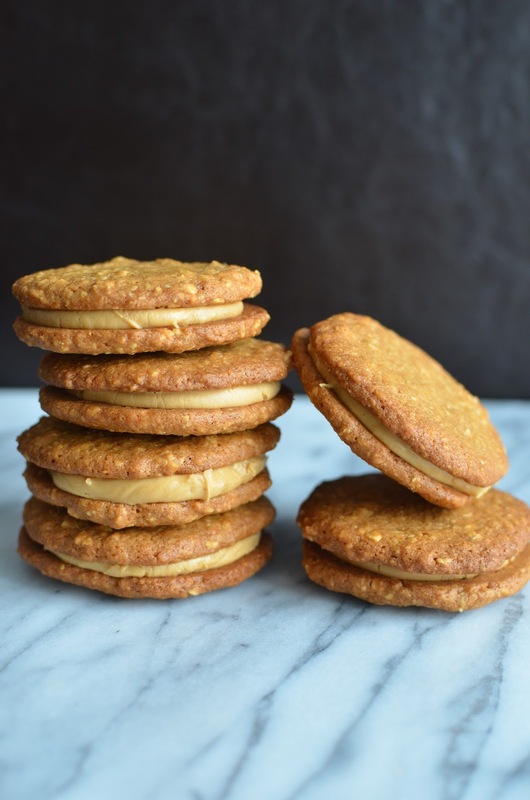 I adore peanut butter everything, and I made peanut butter cookie sandwiches once upon a time but they were different than these...and now I want these! So peanut buttery. Pinned! This has got to be the pinnacle of homemade PB cookies - haha...maybe I'm exaggerating but I think the peanut cookies together with the uncooked pb filling just takes us to PB heaven! You know how I felt then, my friend! I had to give the chocolate filling a try! If you do make the chocolate filling, I'd start with less confectioners' sugar and add just enough to make it stiff enough to hold but not too stiff. I found I probably could've used less sugar - the filling stiffened up quicker than I expected. I made these a few weeks ago! But burnt half of them, so couldn't/didn't take pictures. I loved the ones that we could actually eat, though! Oh no! And you know something - I was worried about the bake too. The recipe/intent is clearly for dark brown cookies to get that crispness and it would be easy when you're busy to leave them in a minute or two too long and burn them! I got lucky and you've reminded me to be extra mindful next time...because I'm already plotting the next batch. Absolutely gr8 peanut butter sandwich cookies! A nice change from the creamy ones. i don't always make peanut butter cookies, but when i do, i like as much peanut butter flavor as you can pack into them: no subtle peanut cookies for me! And these look incredible: the double dose of cookie and filling seems perfect to me. It's peanut butter heaven if you want a peanut butter cookie. I am/was thinking about trying another recipe that's similar but I think this one is IT for its category.